We have always been very proud of the atmosphere we create at the Old Peacock on Leeds United match days. When Leeds are at home it is our bread and butter of course, we are known as a football pub despite everything we do in between games, and while ourselves and Leeds United reside where we do, that will always be the case. As a result we put a lot of work into making match days work for everyone and in general the fruits of this is the buzz of conversation, laughter and chanting that makes the match day atmosphere so intoxicating. September saw us introduce another factor to this; live music. It is something we have never attempted before and we were a little apprehensive about it, at the end of the day, if it isn’t broken, don’t fix it. But that isn’t in keeping with our philosophy, which is essentially to always strive to make improvements and never become complacent. So as The Snapp belt out ‘A Town Called Malice’, ‘She Bangs the Drums’ or ‘That’s Entertainment’ in the beer garden we can be satisfied that we have pushed ourselves to provide even more for our loyal customers and Leeds fans. Naturally, if Leeds United are doing well it makes our jobs a lot easier. But one of the many fascinations of the modern world is how Leeds fans have remained so chipper in the face of a decade of largely meagre pickings at Elland Road; season after season of mediocre performances, under-achievement and off-field chaos somehow hasn’t dented the enthusiasm of our customers. Still they arrive with a raging thirst and an undiminished vigour for the match day routine, to share some pre-match beers with their mates. Of course, to many that is the only thing that is important, for others the pre-match routine and the social aspect has become an indispensable substitute for the blood and thunder of events on the pitch at Elland Road; a sort of life-support machine in the absence of Leeds United offering any thrills and spills over the road from 3.00pm onwards. So imagine our surprise when Garry Monk finally got the lads firing and we saw, not just home wins, but entertaining, attacking football from the men in white? 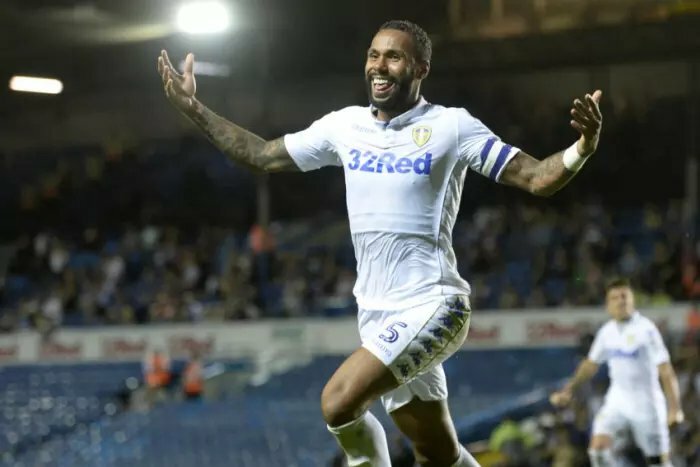 Leeds have been solid, dominant and expansive in their football, and since I last wrote, three home wins in the League and one in the League Cup have turned the season around. 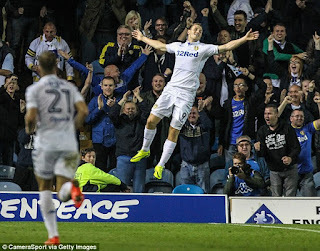 Of course, Leeds have won sporadic home games before over the last few seasons (honestly, they have, you may have blurred them out) but nowhere near enough, and anybody who has witnessed the last month at Elland Road will recognise that this feels very different; there is something in the air and it isn’t just the whiff of Pontus Jansson’s aftershave. Our Swedish recruit on loan from Torino has been a major factor in Leeds fans not squirming uncomfortably and hiding behind their half-time pie every time a cross enters our penalty area in recent games. Jansson has been a colossus at centre half, like a Viking marauder fearlessly rampaging through the Championship and leaving a trail of timid and fearful million-pound strikers in his wake. Again, we have maybe been here before. The likes of Marius Zaliukas and Sol Bamba initially entranced us with their performances, and we briefly felt like our saviour had arrived, until they signed a permanent contract and slipped unnoticed into the legions of Elland Road’s most unexceptional and forgettable. It is so easily done and yet something feels different about Pontus Jansson. We are so desperate for genuine heroes, against a grim decade of famine in that regard, that we will latch onto anything that suggests a way out of this. But there is a sense of composure, nonchalance, surety and aggression about Jansson that suggests he is the real deal. We are all waiting for the catch but maybe, for once, there isn’t one. The run of four straight home wins started with a scrappy and desperate 2-1 win over Blackburn Rovers. This was the Tuesday night after Huddersfield Town had beaten us 1-0 at home on the Saturday. It was absolutely vital that Leeds got the three points, and it didn’t really matter how we got them. Since then, we have beaten Blackburn again in the League Cup with a much-changed team, and have then glided effortlessly past both Ipswich Town and Barnsley, without the scoreline truly reflecting our superiority. It is the Leeds way of course, they would never allow us the luxury of enjoying a commanding and technically-adept display without the eternal fear that we are one sliced clearance away from dropping yet more points at home. But suddenly there is a natural vibrancy to Elland Road and that unmistakable energy and a healthy glow that comes from actually enjoying what you are watching. There is an audible sense of expectation rather than a debilitating fear and apprehension, which a succession of owners, managers and players have failed to overcome, and as a consequence we are feeling that in the Old Peacock. We are not taking credit for transforming Leeds United’s fortunes simply via introducing live music before home games, but the extra buzz this is creating is certainly sending fans off with an extra skip in their step, which the football on show at 3.00pm is not stopping dead in its tracks. We should be wary that we are only talking about a few games, however, and Leeds are still yet to penetrate the top ten, never mind the long-coveted play-off spots. We are on the run-in to Christmas now and the chilly Saturday afternoons that swiftly turn into dark nights by the final whistle. This is when teams with promotion pretensions tend to get found out, and if we are still hovering around the upper half of the table when we are defrosting the turkey, and certainly when we are pretending to get fit as a new years’ resolution in January, then it’s time to get serious. 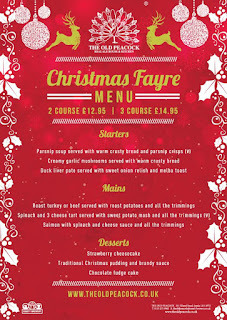 On that note, we are also on the run-in to a busy period at the Old Peacock, and we are already completely booked out for our traditional Christmas Dinner menu on December 25th. 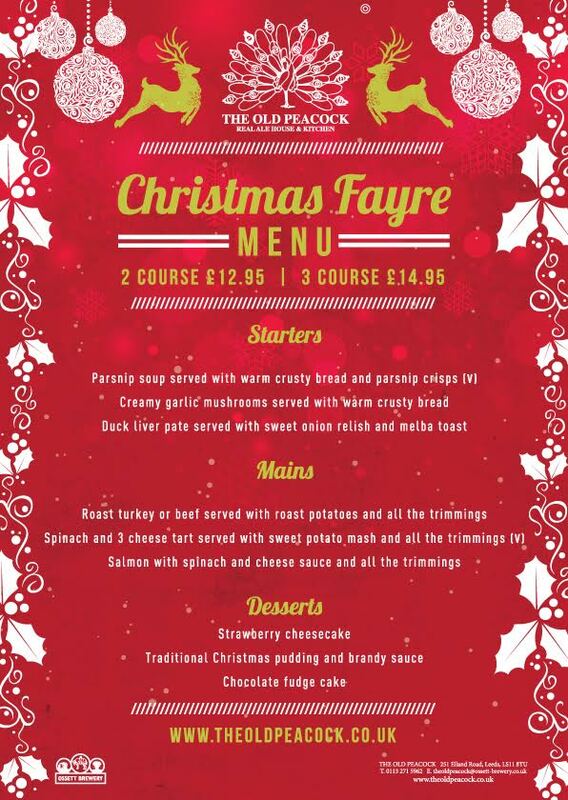 We are aware that the festive party season will soon be in full swing, however, and we have plenty of booking space available for our Christmas Fayre menu, which is perfect for celebrating Christmas a little early with friends, family or workmates. So call in or phone us to book a place. In the meantime, buckle up and enjoy the entertainment at Elland Road.